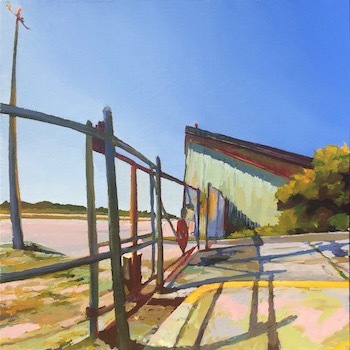 Known for her panoramic oil paintings developed from direct observation, Susan Stephenson uses scenery from her everyday life and transforms it through an exploration of color and light. She looks for beauty in the mundane and is inspired by traffic lights, stop signs, electric lines and other common items that are usually overlooked. A native of Louisiana, she received her Bachelor of Fine Arts from Louisiana Tech University and her Master of Fine Arts from Boston University, where she studied with John Moore. After living in southern New England for over twenty years and teaching at the Lyme Academy College of Fine Arts, Stephenson moved to California and now teaches in the Department of Art at Stan State.